Why and how to apply Systems Thinking to the design, structure and day-to-day running of your organisation. In The Search for Leadership, Bill Tate showed how leadership needs to be considered from an organisational perspective rather than from the conventional perspective of developing individual leaders. 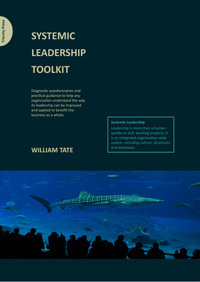 Now, in the Systemic Leadership Toolkit, he has put together a practical guide that addresses this need. Based on the author's extensive consultancy work on leadership issues, the Toolkit uses a Systems Thinking approach and a series of self-assessment questionnaires to guide you through the entire improvement process. Use the Toolkit to diagnose and understand the leadership gaps that prevent your business from flourishing, then use it to create implementation strategies for improving the way leadership operates. The Toolkit is designed to offer a stand-alone improvement process for any organisationbut it can also be used in collaboration with an internal or external specialist/consultant. Stop polishing the fish and tackle the water they swim in. The organisation is the fishtank in this metaphor, and good leadership is achieved and maintained by paying attention not to the state of the individual fish but to the surrounding environment. In the systemic leadership model, individual leaders still provide personal leadership, but in a way that is mindful of the needs of the organisation. The organisation, in its turn, is responsible for creating the conditions in which this is possible. To build a collective awareness of the current leadership process, practice and future needs in the organisation as a whole. To reach practical conclusions around the scope for improvement. To generate the commitment and energy to do something about the current situation. To decide on, plan and implement changes. The Toolkit, which is designed to be run as a self-assessment audit in any organisation, has 9 modules - each reflecting one of 9 key themes from The Search for Leadership. Click here to see a selection of sample questions from the Toolkit and to read the full text of Module 8: Leadership and the Shadow. Click here to see Appendix 2 from the Toolkit: Advice for Systemic Leadership Developers, Consultants and Coaches. See The Search for Leadership - also by Bill Tate. A practical toolkit for HR and other senior executives who want to run an open, effective, responsible and empowering organisation – but aren’t sure where to start. Also a powerful stimulus to fresh thinking for business students.